2012 Ford Focus ST Estate review | What Car? The Ford Focus ST Estate is a more practical version of a car which, we have already concluded, is one of the finest new hot hatches on the market. The Estate gets the same engine as the regular five-door, but also features the extra practicality that only a chunk of extra metal beyond the rear seats can bring. Its standard load capacity is a healthy 476 litres, but this can be expanded to more than 1500 litres when you fold down the rear seats. These figures are largely irrelevant, though, because theres no immediate rival to compare this car against. It is, for the time being, in a niche of its own. 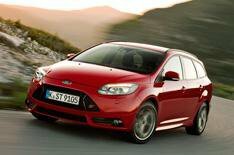 Whats the 2012 Ford Focus ST Estate like to drive? The most important news here is that the ST Estate doesnt feel that badly compromised by its extra practicality. Yes, theres a little bit more body lean, and when things get out of shape, you can occasionally feel it taking slightly longer to sort itself out, but were talking small differences here. In the most part, then, the ST wagon is a hoot. Its 247bhp 2.0-litre turbocharged engine spins up freely almost to the point where youd be forgiven for forgetting that its normally aspirated and pulls strongly right round to the red line. Its quick, too; 0-62mph takes only 6.5 seconds, which is around half a second faster than a five-door VW Golf GTIs time. It sounds great, too, thanks to a 'sound symposer' which amplifies the induction noise and makes it sound like one of Fords old rally cars. The steering wheel does tug left and right when you accelerate hard, particularly on bumpy roads, but it never feels like its about to totally lurch out of control. If you behave yourself, the ST Estate turns into a swift and accomplished cruiser, with an impressively well sorted, supple ride quality. Whats the 2012 Ford Focus ST Estate like inside? The ST Estates front cabin is identical to the five-door models, which means that it has a great driving position (considerably lower than the previous-generation Focus STs), a reasonably plush feel and a natty trio of extra gauges on top of the fascia. As with the regular five-door, ST-1 trim brings Recaro sports seats but a pretty plain dashboard. ST-2 costs 1500 more and adds part-leather upholstery, climate control and automatic lights and windscreen wipers. The range-topping ST-3 brings powered and heated full-leather seats, bi-xenon headlights, rear parking sensors and keyless entry but then it also costs 26,240. The boot is huge for a hot hatchback, and while its not quite as long as the layout in more modest Astra and Golf estates, its a fair bit wider, so youll be able to cram a lot in. The rear seats fold completely flat, and when theyre in their normal position they offer enough space for two large adults or three small children. Youll need to have a pretty specific set of criteria before the Focus ST Estate will tick all of your boxes. Youre paying as much as 1000 extra over a regular five-door Focus ST, for starters, and that car is already more practical than many rivals including the Renault Megane 265 Cup and the Vauxhall Astra VXR. Still, if you really do want estate-car practicality mixed with B-road blasts, this is about your only choice right now - and its a very fine one indeed.